Powdered alcohol – it just sounds like a bad idea, doesn’t it? Some consumers may disagree. After all, one could pour a packet of the stuff into his or her favorite beverage and get drunk off a Coke – no rum necessary. The FDA certainly didn’t see it as a bad thing either; it made Palcohol legal in 2015. The creator of Palcohol touts a number of potential benefits: The injured could use it as a makeshift antiseptic; it could help airlines save on fuel costs by not transporting bottles of the liquid form of alcohol; or it could serve as an alternative beverage for those who want to consume alcohol outdoors. However well-intentioned this invention may be, good intentions can’t stop its unplanned use and disastrous potential. Certain parts of the U.S. are already on high alert about the questionable nature of this powdered substance. In fact, as of today, twenty four states have already banned Palcohol outright. Another nine have proposed legislation to ban Palcohol. The other seventeen are taking a decidedly more open-minded approach, either taking no action to impede its legalization or opting to impose regulations. Looking at the map, a couple things we found stood out. First, one of the states that opted to regulate Palcohol instead of banning it is Colorado, which is a state where marijuana has been legalized and regulated. Conversely, Alaska and Washington have both opted to legalize possession of marijuana, but have imposed outright bans on powdered alcohol. There are legitimate health concerns about improper use of Palcohol. Snorting of the substance is a worry. Still, Palcohol’s maker doesn’t recommend this method of consumption. Snorting it would create an intense burning sensation in a person’s nasal cavity, an unpleasant outcome, to say the least. It would also, according to Palcohol, take 60 minutes to snort the equivalent of a shot. The company’s website used to say that snorting Palcohol would create an instantaneous drunken feeling – a statement that could easily be misinterpreted as promoting this unusual (and relatively covert) route of administration – but that text has since been removed. Another, more obvious risk with Palcohol is its accessibility or transportability; patrons could easily sneak it into public venues and events, increasing the potential for alcohol consumption by minors. Bar staff have a hard enough time keeping an eye on underage drinking. Policing Palcohol will prove even more difficult. The Massachusetts Restaurant Association supported a ban on Palcohol for this very reason. New York state senator Joseph Griffo expressed unease about this as well, saying “There are very serious concerns about the illegal use of powdered alcohol by young people, possibly even bringing it into schools or other events and locations that prohibit alcohol consumption.” Senator Chuck Schumer of New York echoed the sentiment, saying powdered alcohol would only exacerbate an already problematic teenage drinking culture. An additional unfortunate health consequence of Palcohol again has to do with the product’s clandestine nature. Schumer also noted a concern with people adding alcohol content to someone’s food or additional alcohol content to someone’s drink without his or her knowledge or consent. 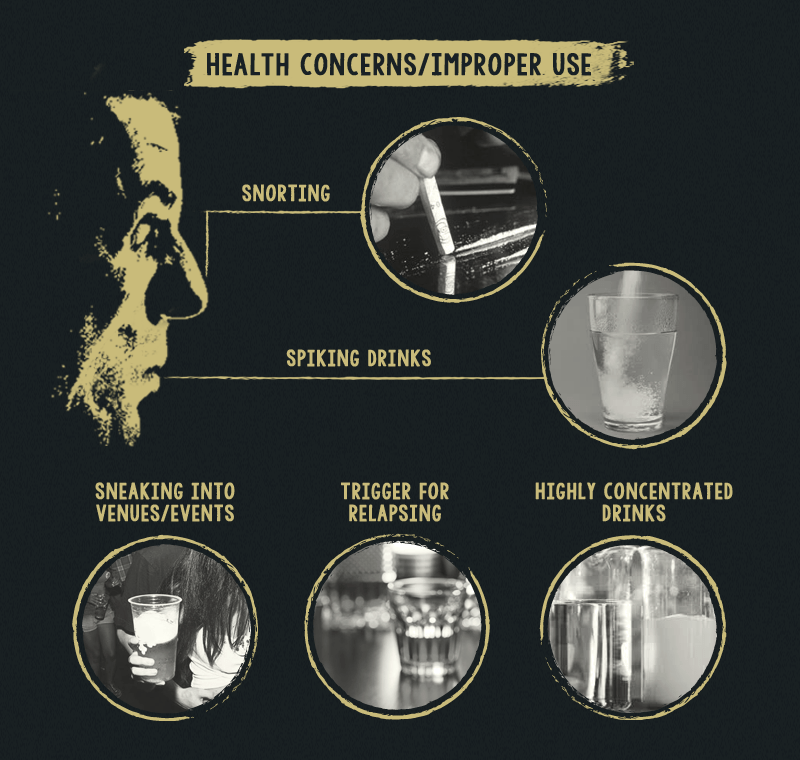 Even for users who knowingly consume Palcohol, it may be difficult to track the amount ingested, especially if Palcohol is added to traditional alcoholic drinks; this combination could lead to overconsumption. 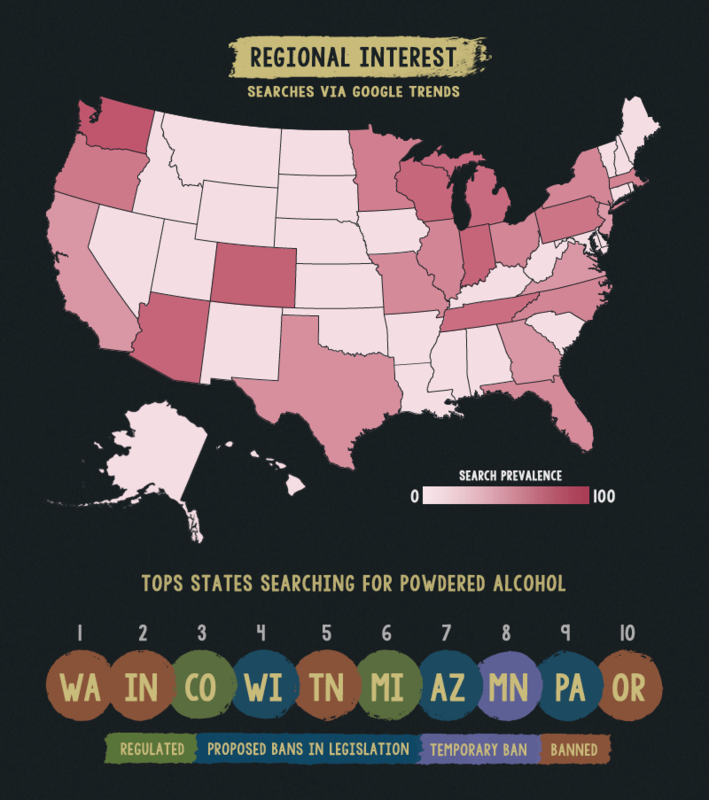 Google Trends shows which states had the highest number of searches for “Powdered Alcohol” and “Palcohol.” Two of the top 10 states expressing interest in powdered alcohol were the two that passed laws regulating powdered alcohol. 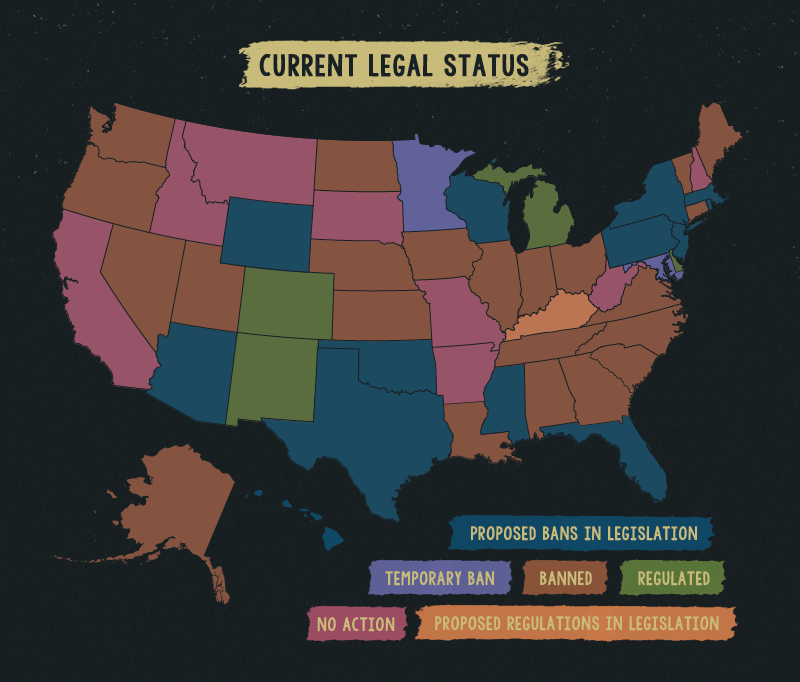 The reason for the large volumes of searches in these states could stem from the states establishing regulations on the product or impending votes on legislation proposing its ban. A 10-year overview of search prevalence for powdered alcohol tells more. What’s interesting here is that outside of major events surrounding the creation and legalization of powdered alcohol in 2007, 2014, and 2015, there doesn’t seem to be much interest in the substance. The Palcohol website argues that prohibition of its product will only increase demand and potentially create a black market for the product. It further notes that people already abuse liquid alcohol, so prohibiting its product would not protect people from misusing it. However, if critics can already think of dangerous ways to misuse Palcohol before its release, the general public might do worse once it’s in their hands – worse than what’s possible with liquid alcohol, that is. The concept of substance abuse broadly describes a wide variety of maladaptive substance use and, for some of these substances, their various methods of ingestion or administration. Alcohol, as an intoxicating substance, has contributed to the prevalence of substance abuse from the beginning. The possible repercussions of a new means to consume alcohol are alarming and, for obvious reasons, could be quite problematic. Arguments can be made that the invention of powdered alcohol may have been born from some legitimate needs or uses, but it’s impossible to ignore the dangerous potential that the product may hold across a range of age groups, and in a multitude of situations. Palcohol or otherwise – if you or someone you know is struggling with alcohol use or dependency, seeking substance abuse treatment may provide much needed help. Make a first step towards recovery – call us at 1-888-322-7779, and speak to a confidential treatment support professional about alcohol rehabilitation or other substance treatment options. We looked at the the current legislations regarding powdered alochol to determine current legal status of powdered alcohol in every state. The health concerns were some of the most commonly cited in news and social media. 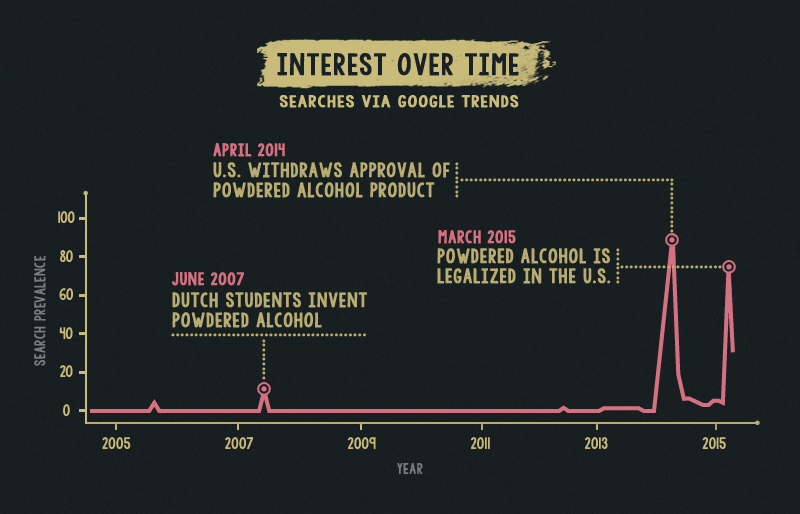 Using Google trends we built the interest timeline that coincided with various news articles around Palcohol and powdered alcohol.